Turns out the original Age of Empires actually looked way worse in 1997 than I remembered—a fact Google Images was all-too-happy to remind me of afterward. 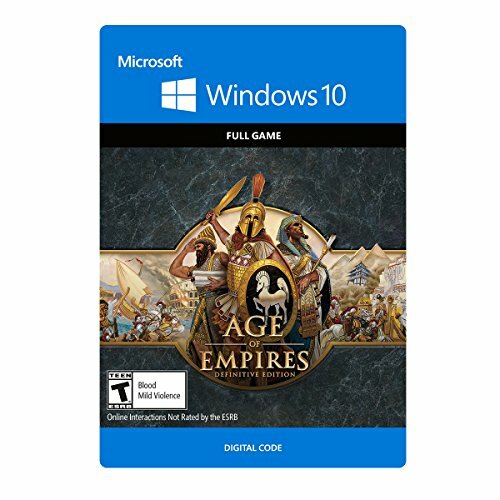 So yeah, as far as the “Remaster” side of the equation goes, Age of Empires: Definitive Edition ($20 preorder on Amazon) is on track to be a resounding success. A miracle, really. 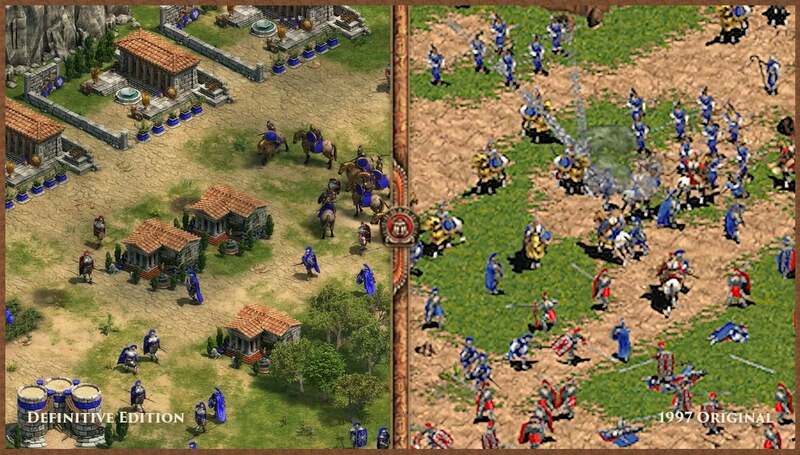 I’d wager the Definitive Edition looks just as good as Age of Empires II: HD Edition, which is phenomenal when you compare what the developers of each had to work with. Here’s a side-by-side comparison of Definitive Edition (left) vs. the original Age of Empires (right) taken from the official website. That’s not to detract from Age of Empires II HD. A lot of work went into that overhaul too, and it also deserves a spot on the all-time best remaster list. But go ahead and pull up a shot of Age of Empires from 1997. It might as well be a raw block of marble next to Age of Empires II, a fully-sculpted Raphael. Definitive Edition developer Forgotten Empires had a lot of work to do here, and somehow did it. The menus are a bit underwhelming, but otherwise the art is across-the-board fantastic. Ground textures and water look vivid, buildings are crisp and crumble in a satisfying way, and the units are impressive looking even when restricted to eight-way movement, cavalry especially. Pathfinding? Not as great. But hey, at least it’s easy on the eyes. The problem is you can only appreciate the remastered visuals when the game works. And that’s a huge caveat, right? It’s also one that only applies to the beta though, and therein lies the problem. Hosting a multiplayer-only beta for Age of Empires: Definitive Edition was (maybe) a mistake. Oh, I’m sure there are good reasons for it. Multiplayer’s important, and it’s hard to test without live players. 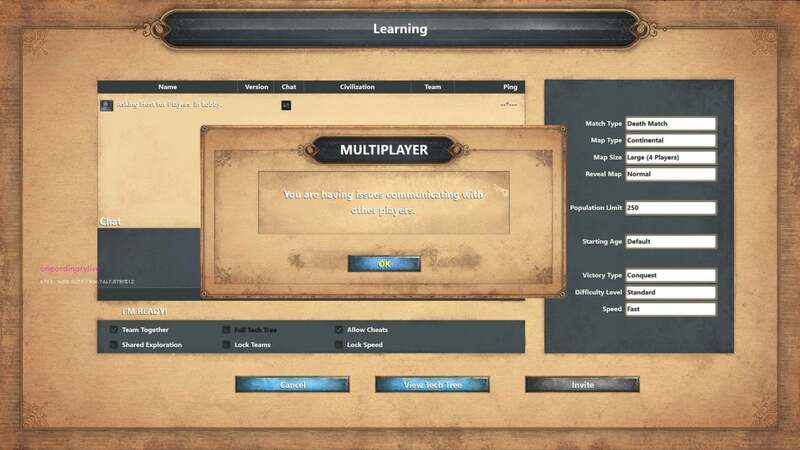 The info Microsoft and developer Forgotten Empires are getting from this beta is undoubtedly important—the team wants to smooth over any lingering netcode issues before release. Good justification for a beta! There are plenty of issues though. I’ve come to loathe the error message “You are having issues communicating with other players” over the last 24 hours. It's just enough information to make you wonder what’s wrong, but not enough to be actionable in any way. Is the problem on my end? Their end? Who knows, but I’ve been plagued by this notification every time I’ve joined a match—both through the automated matchmaking system and the match browser. Sometimes the lobby doesn’t even load. I just get that message and then I’m kicked back to the menu. No other explanation. And it’s not just me. In another lobby, two people who’d “joined” were kicked by the system right as the match began, leading to a team imbalance from the get-go. Problems don’t stop once you’re playing, either. I’ve had workers and other units refuse to follow orders, chat messages seemingly lost to the ether or delayed long past the point they would’ve been useful. Worst of all, the game often freezes every 30 seconds or so, presumably to sync the action back up on everyone’s PC. Some of these problems are due to latency, and perhaps will get better on their own post-release—once more people own the game and are actively looking for matches. I did have some extremely high pings in the beta. But even if some problems are due to latency alone, Age of Empires: Definitive Edition isn’t doing much to help. Since connections are peer-to-peer, there’s no all-encompassing ping for you to measure against in the match browser. Games also don’t seem (as far as the beta’s concerned) to be region-locked, or even let you specify a preferred region. Thus you have no way of knowing what your connection will be like until you’re in a lobby, and even then the situation might change as more players connect. One match I actually had decently fast connection with two other players, and then a third person connected with 200+ ping. That’s enough to make the entire match borderline unplayable, in a game that requires somewhat fast reactions. Patches are going up quickly—Microsoft released one as I wrote this, actually. But whereas the Sea of Thieves beta we played last week seemed like a fairly polished bit of marketing, Age of Empires: Definitive Edition is a beta, full stop. There's nothing wrong with that, but it’s not exactly a great showcase for the game, and it remains to be seen whether Forgotten Empires can fix these problems prior to release next month. I’m even more skeptical, given some of these problems (like latency) rely on Microsoft securing a large enough player base for multiplayer—with the game exclusive to the Windows Store, no less. Starting at a bit of a disadvantage there. But damn it looks so amazing when you actually get to play. I have a few game-related qualms—I hate, for instance, that Age of Empires doesn’t let you queue up research for buildings. (Though mercifully, the Rise of Rome expansion’s unit queuing is included here.) There are also some quality-of-life improvements in Age of Empires II that I miss, like uh...gates. That’s right, I forgot the original Age of Empires let you build fortified walls but not gates to get out of them. 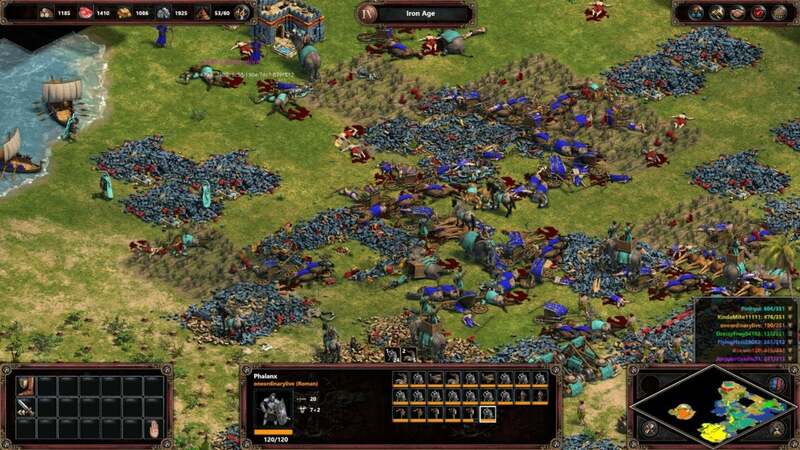 Purists will love it though, and even the Age of Empires II diehards like myself might find it interesting to revisit the first game, if only for the campaigns. 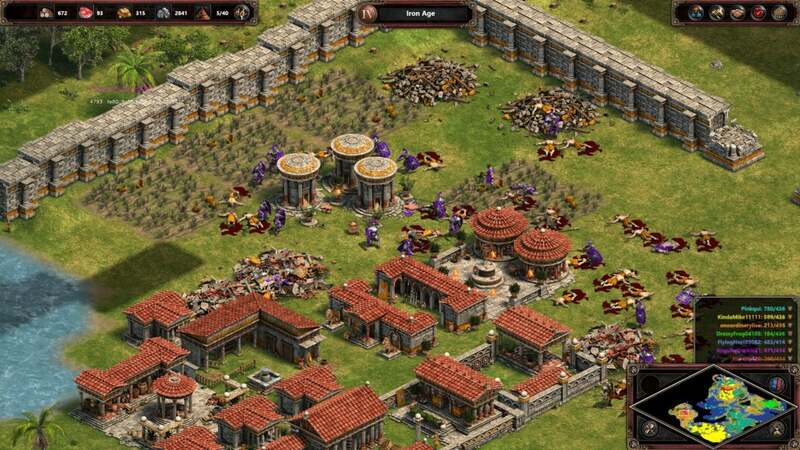 I’m looking forward to playing through Rise of Rome again—it’s been a long time since I went back to the original. And hey, no need to worry about network issues there. Look for the full release (and our final review) on February 20.